I heard Richard Tucker "live" in recital in April, 1972, in Lincoln, and it was a memorable event. At the age of 58, Mr. Tucker sounded 20 years younger. His flawless technique had kept his voice young and his artistry only expanded. To this day I can hear his "Vesti la giubba" from Pagliacci that evening, and "If with all your hearts" from Mendelssohn's oratorio Elijah. The beauty of his voice and the ringing brass-like high notes remain in my memory. Rudolf Bing had said of Mr. Tucker, in 1955, "Caruso, Caruso. That's all you hear around here (the Met Opera). Someday we are going to be proud to say we heard Tucker." Indeed. He had a 30-year career at New York's Metropolitan Opera where he was a leading tenor and was always welcome in Chicago as a guest star tenor. In later years he sang at Covent Garden in London and in South America and Italy. His great tenor roles were primarily in Verdi and Puccini, but he sang Mozart with a liquid bel canto. La Boheme, Tosca, Manon Lescaut (his favorite tenor role, he said), Aida, Il Trovatore, Rigoletto, La Traviata, La Forza del Destino, Simon Boccanegra, Luisa Miller, Carmen and La Gioconda, his debut role at the Met Opera and in Verona, all were Tucker specialties. In later years he assumed the tenor lead roles in Pagliacci, Samson et Dalila and his crowning achievement, La Juive. I value the letter he sent to me in November, 1974, in response to a "fan" letter I sent. He graciously replied about upcoming opera season plans and also sent a signed photo. Sadly, he was gone within two months from a massive heart attack, which he suffered while on tour with his baritone friend Robert Merrill. At the age of 61 he was still in fine fettle and had a busy upcoming schedule all over the world. His funeral was held on the stage of the Metropolitan Opera House, his artistic home for three decades. His legacy even thirty years later remains secure. The contents and visual images on this page are the property of Keelan Music Archives/www.keelanmusic.com. Please write for permission to use them on other websites. 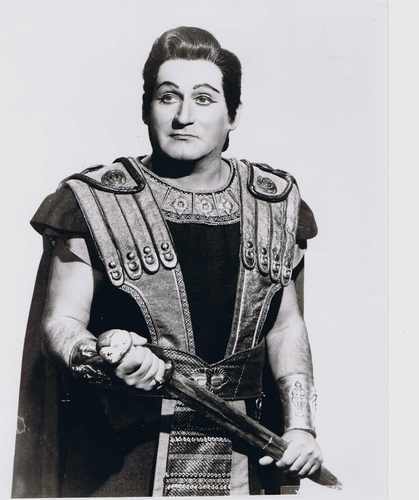 portrait below: Richard Tucker as Radames in Verdi's "Aida"
One of Richard Tucker's greatest dramatic tenor roles was Radames in Verdi's "Aida," a role he assumed in 1965. He had recorded it "live" in 1949 with Toscanini/NBC Symphony co-starring Herve Nelli, Giuseppe Valdengo and Eva Gustafson and it was released in 1955 on RCA Victor. He recorded it again in August, 1955, for EMI, co-starring Maria Callas, Tito Gobbi and Fedora Barbieri, with the La Scala Opera conducted by Tullio Serafin. I asked him which he prefered--he paused, thought a few moments (and seemed like he'd never been asked that before!) and then said simply, "this one (1949) is younger." So, there you have it! But to hear a finished portrayal we must turn to one of the post-1965 Met Opera performances. He sang the role with Leontyne Price, Renata Tebaldi, Birgit Nilsson, Martina Arroyo and other great Aida interpreters. portrait photo of Mr. Tucker as Verdi's Radames, purchased from La Scala Autographs. http://www.musicautographs.com/. studio casual portrait below sent to this author from Mr.Tucker's management upon his request, 1974. Without a doubt the five RCA Victor Red Seal complete operas he made on loan-out from Columbia Masterworks from 1959-1964 are valuable to the Tucker "fan." They include Verdi's "Il Trovatore" (1959) with young Leontyne Price and his friend Leonard Warren as well as Rosalind Elias and Giorgio Tozzi; and "La Traviata" (1960) with Anna Moffo and Robert Merrill, the favorite "La Traviata" even today of many. I am now on my third edition of the 1961 "La Boheme" taped in Rome with the Opera. Leinsdorf conducts Tucker, Anna Moffo, Robert Merrill, Mary Costa, Philip Maero and Giorgio Tozzi in a splendidly realized performance, full of glorious singing and passion! I have owned it on records since the 1970s and purchased all three CD editions. The latest is a super audio hybrid and it sounds like it was recorded yesterday. I don't know how they retrieve so much sound from nearly 50 year old tapes but they have found a way. Only $20. Buy it! I also have a special fondness for the "Madama Butterfly"(1962), with Leontyne Price, Rosalind Elias and Philip Maero. Leinsdorf/Rome Opera, again. It is my personal favorite recording of this lovely opera. Finally, of the RCA sets, the 1964 "La Forza del Destino is still the standard recording for many Verdi buffs; Leontyne Price is superb, and Robert Merrill, Shirley Verrett, Giorgio Tozzi and Ezio Flagello join Mr. Tucker (at his best...and he is nearly 50 years old at the time!) under the direction of the great American conductor Thomas Schippers. The singing and conducting are matchless. I've played all of these sets dozens of times over the decades and never tire of them. There's just ...something...about those glorious voices of the 50s/60s. Interestingly, all five of these RCA Victor sets were known as the All-American casts, as all the lead singers were Americans. Bravo, RCA, for that! His Columbia Masterworks "Rigoletto" is an under-appreciated set, with the San Carlo Opera in Naples in 1958. His voice as the Duke, another of his great roles for twenty-five years, is thrilling. His colleagues are Gianna d'Angelo and Renato Capecchi. The "Il Trovatore," "Forza" and "Rigoletto" are not available at this time so check Amazon and Ebay for the records or CDs. 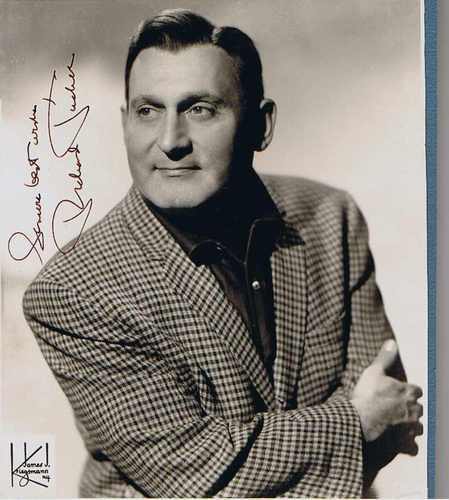 His other, earlier, Columbia Masterworks sets (1947-1954) including "La Boheme," "Lucia di Lammermoor," "Cavalleria Rusticana," "I Pagliacci," and "Die Fledermaus" interest me less--the casting is not as strong as what RCA Victor gave him--although the English-language "Cosi fan Tutte" based on the Met Opera production is very well sung by him, Frank Guerrara, Eleanor Steber and others. And the 1949 "Madama Butterfly" with Steber and Guarrera holds up very well. He also recorded "La Forza del Destino" in 1954 with Callas for EMI but I find it less -engaging than the RCA version. The two "Aida" recordings are mentioned elsewhere. A top Verdi "Requiem" is the 1964 Columbia Masterworks set with Ormandy and Philadelphia Orchestra with the Westminster Choir. Mr. Tucker is joined by Lucine Amara, Maureen Forrester and George London. There is an "air-check" of this dramatic work circulating on CD these days with him, Herve Nelli, Nan Merriman and Jerome Hines--Guido Cantelli conducting the New York Philharmonic Orchestra. Pretty exciting and worth finding. Mr. Tucker's "Starring Richard Tucker" (1955), "Famous Puccini Arias" (1959), "Verdi Arias" (1964), and The Soul of Italy (1965) are simply superb. The Jewish sacred music recordings of Goldfaden songs (late 1940s), Welcoming the Sabbath (195) and Yom Kippur (1959) are excellent, too. He once said if one could sing that music, he could sing anything! I believe it. He even did two "pop" albums--"The Fabulous Voice of Richard Tucker" (1962) and "What Now My Love" (1966) which are examples of a great voice singing lighter material. His "Exodus Song" from the first one is a classic. In 1973 Richard Tucker and Robert Merrill brought their duo recital to Carnegie. "Old Lions" at 59 and 56 years of age, they gave a memorable concert. The 2-record London set is long gone but was available some years back on the Teldec label on one CD. His final recording was a 1974 highlights Lp of Halevy's "La Juive," with Anna Moffo, Martina Arroyo and Bonaldo Giaotti. It is an interesting souvenir of Tucker in his penultimate role but several complete opera "live" performances exist on CD of him in "La Juive"and those are preferable. There are television appearances from the 1950's/60s also on VHS and DVD from The Voice of Firestone; Bell Telephone Hour; Camera 3 and the Ed Sullivan Show with him in resplendant voice.